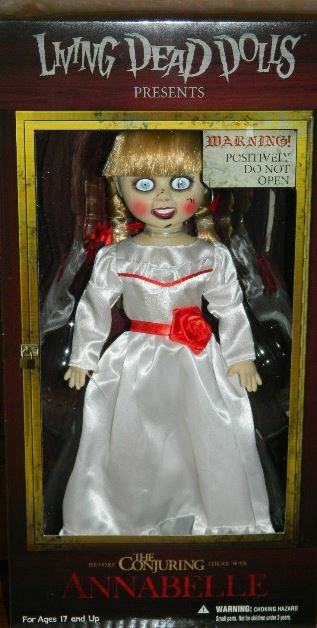 Living Dead Dolls Presents The Conjuring Annabelle Doll  - $59.99 : Mystic Crypt, the most unique, hard to find items at ghoulishly great prices! Horror fans first met Annabelle in the sleeper hit THE CONJURING. Although she was just a supporting character, she gripped the imaginations of viewers and dug her cold plastic hands into their hearts. 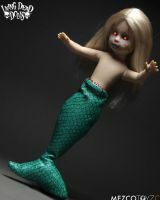 Now as she prepares to return to the big screen as the star of ANNABELLE, a film dedicated to her origin story, she finds herself as the newest member of the Living Dead Dolls family. 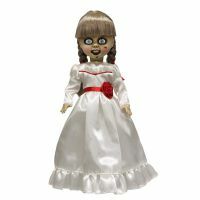 The Living Dead Dolls Presents: Annabelle figure will stand ten inches tall and feature five points of articulation. She wears film accurate clothing and features the same hairstyle as seen in the film. Annabelle, the sinister conduit to the damned, comes complete in a collector friendly window box that may help keep the malevolent entity the cultists conjured contained…then again, it may not. Each 10 inch figure has 5 points of articulation, wears real cloth clothing, and comes individually packaged in a collector friendly window box. Collector box measures 14 X 7 X 3 1/2 inches. Each doll is sold separately!